Delicious egg noodles with roasted duck soup is one of the most popular Sino-Khmer recipes. Cook 8 cups water in a large pot till water bubbling, add noodle to boiling water, stirs and cook till noodle tender( do not over cook). Pour cooked noodle in a colander, rinses under cold water and set a side to drain. In a large soup pot, put chicken bones with whole onion, garlic, salt,chicken bouillon, all spice powder and water together. 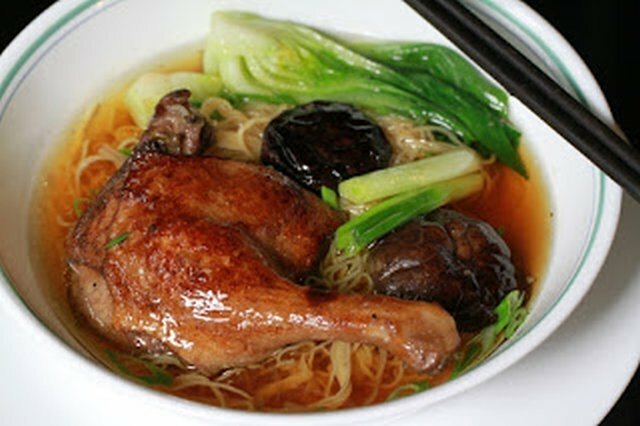 Cook in low heat for at least 1 hour, removes chicken bones, onion and garlic from soup broth, keep only broth. Seasoning broth with fish sauce, sugar and black pepper, stirs and keep broth simmering on stove. Cook 4 cups water in a large pot, add Chinese broccoili to boiling water and cook for 2 minutes or to your liking. Pour cooked vegetable in a colanderand set a side to drain. Turn up cooking temperature to high when ready to serve. Put some egg noodles in a bowl, add few pieces roasted duck and a stalk boiled Chinese broccoli, add some green onion, roasted onion, roasted garlic and pour hot soup broth over. Serve hot along with hoisin sauce and Sambal Olekek chili paste.